The green clay has antibacterial properties, which is why it will work in the care of problematic skin. Face masks on its base mattify and smooth the skin, they have antiseptic properties and prevent the appearance of imperfections. What properties, composition, and application does the green clay have? What are its types and how to prepare a homemade face mask with green clay? Green clay has, as the name suggests, a greenish color, which is determined by the iron ions contained in it. It is extracted from deep silica-aluminum deposits located in France and the USA. This most popular type of clay is especially recommended for oily and acne skin. Green clay can be used not only externally, but also internally. Taken in the form of a drink, it supports the treatment of diseases of the digestive system and fights oral inflammations. There are two types of green loams: montmorillonite and illite. Montmorillonite is mined in the south of France. Its name comes from the Montmorillon region, in which it was discovered. Montmorillonite contains 20 mineral salts and numerous micronutrients and trace elements. Illite is obtained in the USA, specifically in the state of Illinois. Although it contains less valuable elements than montmorillonite, it also heals the skin and regulates the processes occurring in it. Both types of green clay are available in online and stationary stores at a similar price. When buying, it is worth paying attention to the color, which should be clearly green, because a beige or grayish color indicates the low quality of the product. What’s more, long expiration date and composition free of any additives (label: “100% clay green / green clay”) are also of great importance. Green clay is a wealth of micro and macro elements that have a beneficial effect on the skin. Silicon accelerates skin healing processes and regulates the secretion of sebum, while magnesium delays skin aging processes and prevents allergic reactions and inflammation. Calcium stimulates the regeneration of cells and leaves the skin taut and moisturizes whilst selenium firms the skin, reduces discoloration, increases protection against UV radiation and has anti-fungal and anti-bacterial properties. Manganese protects against the negative effects of free radicals and reduces skin tension, thereby correcting wrinkles, while phosphorus promotes cell renewal and maintains proper pH of the skin. Copper regulates the work of sebaceous glands and oxygenates skin cells and makes it elastic. Iron improves collagen synthesis and accelerates the regeneration of damaged cells. Green clay contains bio-elements in high concentration, thanks to which it has a beneficial effect on a problematic complexion. If used on a regular basis, it balances the secretion of sebum, so that the skin is less greasy, and the pores are reduced. In addition, it has antibacterial and antifungal properties, and as a result, it limits the development of blemishes and effectively cleanses and binds toxins. What’s more, it accelerates the healing of inflammation, brightens and evens skin tone as well as smoothes out its structure. 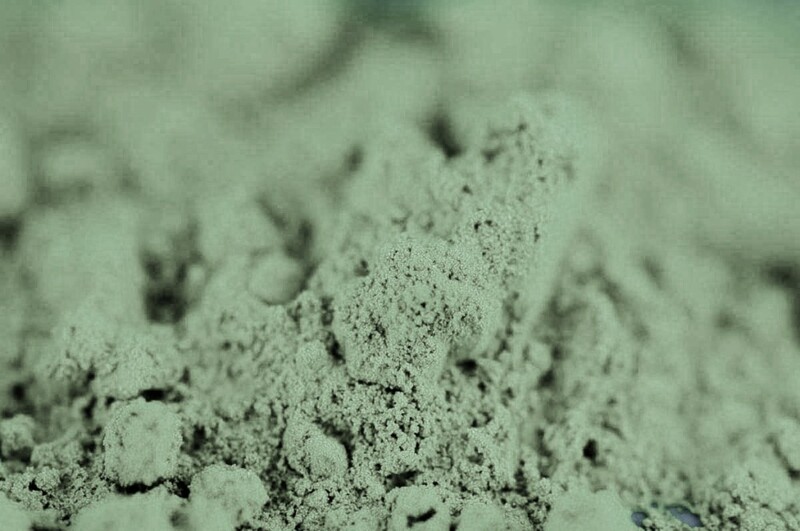 Green clay firms and oxygenates the skin, and thus – delays the aging process. When applied to the thighs – it reduces cellulite. Green clay has beneficial properties thanks to which it has found a wide range of care applications. Green clay can be applied to thighs and other large parts of the body – it will provide anti-cellulite qualities, improve circulation and firm. If our skin has the tendency to dryness, the mask should be enriched with a few drops of essential oil. After applying the mask it is recommended to wrap your thighs with plastic wrap and wait about 15 minutes, preferably under a warm blanket. After about 15 minutes, give it a rinse the clay. After applying the clay, instead of washing it off the skin, you can use it to perform a delicate exfoliating scrub. The powder is so small that it does not irritate the skin, and yet, removes dead skin cells perfectly. You can add green clay to the bath. For this purpose, pour it into the tub in an amount of about half a glass under running water. To get a hair washing paste, simply mix the green clay with water. The resulting paste should be applied to moistened hair and scalp, and then massaged for 2-3 minutes. The blend will absorb all impurities and sebum, strengthen hair roots and act on the scalp like a gentle scrub. The effects of applying clay in this form are visible almost immediately: the skin becomes brighter and smoother. How to prepare a cleansing face mask with green clay? Preparing a mask based on green clay is very easy. Do not use utensils, cutlery and other accessories made of metal, because the latter takes away the medicinal properties of the green clay. To prepare a cleansing mask with green clay, pour a part of green clay into a clean container. To cover the entire face and neck a tablespoon of the powder will suffice. Then, add a small amount of water, preferably distilled or bottled, and do not stop mixing until you get the consistency of thick cream. Later, use a finger, spatula or brush to apply a mask for the face, neck and/or neckline. Wait for 10-15 minutes, but do not let the clay completely dry out. To prevent this, spray it with thermal water or hydrolate from time to time. Finally, wash the mask down with lukewarm water.